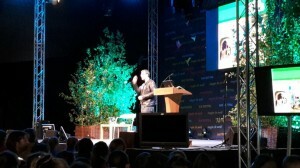 I played my first Hay Festival this week! 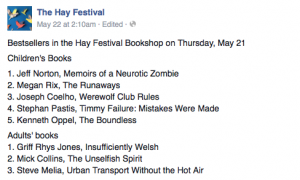 If you don’t know, Hay is like the Glastonbury for books…or the ComicCon for literature. It’s a huge festival in a tiny town. The organizers (who must be super organised) set up a tent city in a field, complete with bookshops, bars, restaurants, a swishy green-room, and even a 1,500 seat theatre. When I arrived (in the middle of the night), I had no idea how gorgeous Hay-on-Wye was. I woke up, opened the curtains and was visually overwhelmed. And the whelming kept on going. I turned up at the Festival, expecting to give a talk to about a hundred or so young people, hoping for two hundred at best. But when I took the stage (with a head mic that made me look…and feel! like a rock star), there were twelve hundred people in the crowd. I think that’s bigger than the population of Hay itself. It was wild. 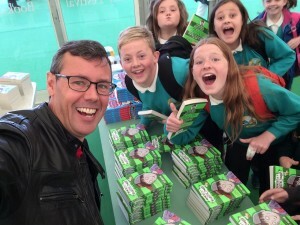 For one amazing hour, I spoke to the students about reading, writing, and…zombies. But mostly I spoke about empathy, about how the process of reading, forces you to imagine life as someone else…the building blocks for empathy. 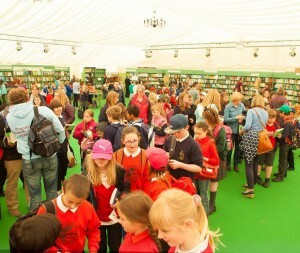 What is so great about the festival is that it brings reading, something quite solitary, into a celebrated, social environment. The exponential impact of students talking to one another about books, about reading, about life, cannot be underestimated. I got to meet other authors, including fellow Canadian Kenneth Oppel (and bought his latest, Boundless), the wonderful Gill Lewis, and reconnected with Michele Paver. Annoyingly, I just missed Joseph Coelho, but I heard his event was amazing. I signed for four hours until I ran down two sharpies and my hand fell off. Luckily I had another one…. 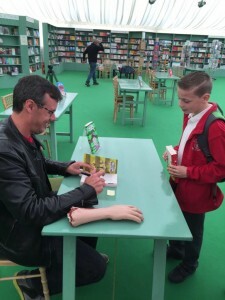 And Memoirs Of A Neurotic Zombie was the best-selling kids book of the day! BOOM! 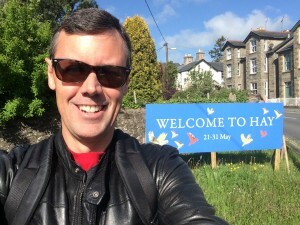 I have to give a huge thanks to the Hay organisers, Faber & Faber, but mostly to the teachers, librarians, and students who made it an awesome day in Hay!